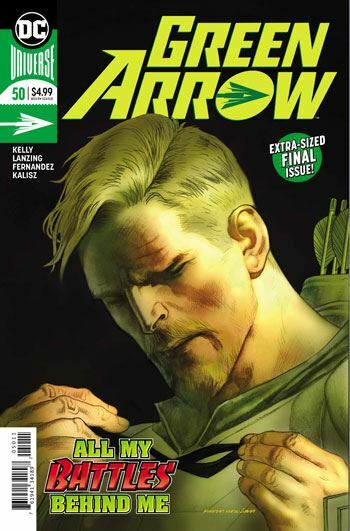 Green Arrow’s series goes out with a double sized issue, which sees him having to fight off not only the government, but Black Canary as well. It’s a decent enough finale. The art is gritty and intense, which suits the story well, and I have to give credit to the writing when it comes to the scenes between Arrow and the Canary. What we don’t get is some surprise revelation that she has been against him all along, or some weepy weakness in the battle scene “because I love you!” or any other kind of cheap twist. Instead, Canary does her best to fulfill her mission. This involves fighting, but it also involves some serious conversation between the pair. Green Arrow, at his best, is always on the edge of being a renegade, so the situation is more than warranted. The fight brings a tension to their relationship, and a betrayal, but it all feels very real. On the downside, the resolution of the plot thread involving the mysterious box that the Martian Manhunter gave to Green Arrow is not satisfactory. It tries to play both sides of the game, and winds up achieving nothing. I won’t say anything more, since it plays out at the very end of the issue, but it did weaken the story as a whole. It’s only a matter of time before Oliver Queen gets another book. I hope it’s as strong as the last few issues of this run have been.